Tired of your Sport band, and not feeling the Leather Loop? Third-party bands to the rescue! Here’s what they're really like. One of the greatest features of the Apple Watch is its band design: If you don’t like the band that you ordered with your Watch, just swap it out for something new. While Apple has a ton of great-looking options, its designs can be limiting if you’re not a fan of their looks, price points, or materials. Luckily, third-party Apple Watch bands have hit the market, offering more affordable leather straps, glittery sport-like bands, mixed-metal designs, and more—not just cheap $20 knock-offs of Apple’s own unique bands. We tested six third-party bands from three different companies to find out which ones are worth pre-ordering—each of them offering something completely different from Apple’s lineup. (Don’t worry: No mullet watches found here.) Let’s take a look. Case-Mate’s Brilliance band is undeniably pretty, but is it pretty enough to warrant an $80 price tag? 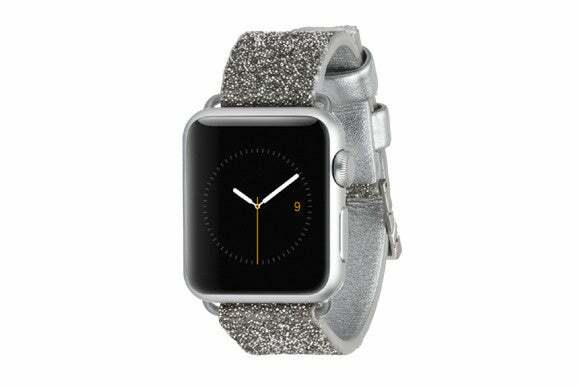 This sparkly leather band comes in silver and black variations for the 38mm Watch, and just silver for the 42mm Watch, and is still listed as ‘coming soon’ on Case-Mate’s website. The Brilliance band consists of two leather pieces that snap into either side of your Watch. The hardware (adapter and buckle) has a bright silver matte finish, which is sort of a mix between the stainless steel finish of the Watch and the matte aluminum finish of the Watch Sport. It doesn’t match my Watch Sport casing exactly, but it doesn’t look bad. The underside of the band is silver leather, while the topside is covered in tiny silver and gunmetal beads. There are also tiny crystals scattered among the beads, but they’re few and far between—and the band doesn’t look nearly as posh as does the Brilliance iPhone case, which is smothered in crystals. The beads and crystals are embedded in some sort of clear, rubbery material, which cheapens the look but appears to be very secure—I didn’t lose any beads or crystals while wearing the band. The Brilliance is very comfortable and easy to fit, thanks to its soft, supple leather construction. This band looks nice but not fabulous—it looks more like a regular watch band with a little extra texture rather than the blinged-out crystal band that the name seems to suggest. Case-Mate’s champagne-colored Sheer Glam band is another band with an iPhone case equivalent—you know, just in case you want your iPhone and Watch to match. 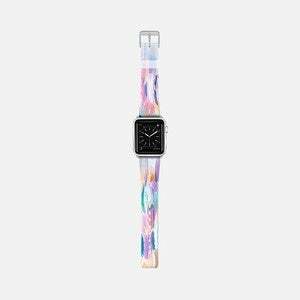 This $35 glittery translucent band is available now for the 38mm Watch only. The Sheer Glam band comes in two transparent elastomer pieces (not to be confused with the fluoroelastomer of Apple’s Sport band), which feature tiny flecks of champagne-colored glitter. The adapter is built right into the band—no metal hardware to contend with, though you can see the metal adapter’s insides through the transparent elastomer, which isn’t particularly pretty. The Sheer Glam has a matte silver metal buckle and two elastomer loops to keep the end of the strap in place, but these loops are not quite tight enough and tend to slide while you’re wearing it. 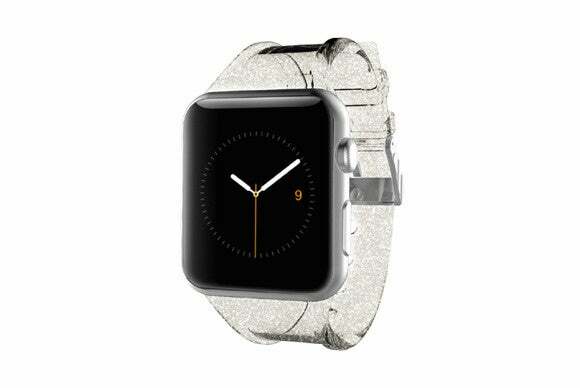 I like the way the Sheer Glam looks—it’s sparkly but still casual—but compared to the Apple Sport band it’s stiffer and has a more plasticky feel. Casetify’s bands are all the same, construction-wise—the only difference is the design and hardware. 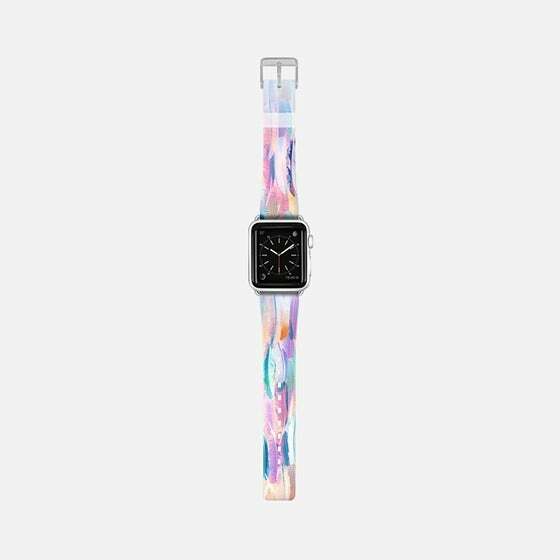 I tried out two of Casetify’s $70 bands: One adorned in watercolor feather print (Candy Feathers) and one sporting a multicolor diamond check pattern (Pass This On). Casetify is all about customization—when you choose your Casetify band, you can pick a pre-made design or upload your own, and you can also choose matte silver or matte black hardware. The Candy Feathers band came with matte silver hardware, including matte silver adapters that were only slightly darker than my aluminum Watch Sport casing. Pass This On came with black hardware (black adapters and a black buckle). Casetify’s bands are made of thick, flexible polycarbonate and are very comfortable—on par with Apple’s Sport band. The bands are soft, with inside ribbing for extra flexibility, and a transparent polycarbonate loop to keep the band in place. My only real complaint was that the 38mm band was a little long for my wrist, but I have a pretty small wrist (5.5 inches). Casetify’s bands are excellent: Comfortable, durable, and eye-catching. While $70 might seem a bit expensive for a casual, sporty band, remember that Apple’s Sport band is $49—so you’re really only paying $21 extra for a custom design, which is well worth it. 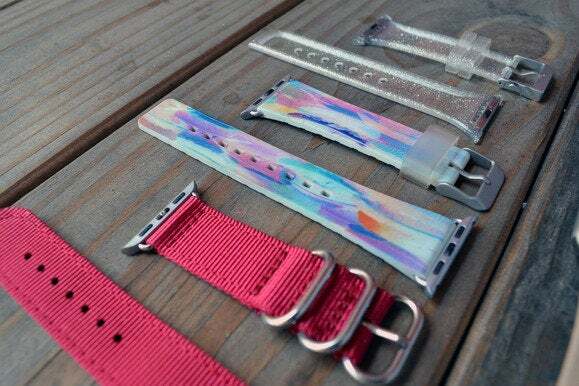 Monowear’s $60 Nylon band may seem basic, but this brightly-colored strap is eye-catchingly different from any of the other third-party Watch bands I’ve seen. Perhaps that’s just because it’s been years since I’ve seen a watch with a nylon band (I believe the last one was my black-and-purple Timex in third grade). 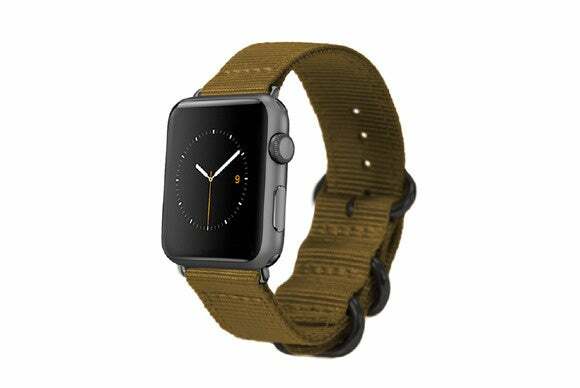 The Nylon band comes in black, red, turquoise, pink, purple, gray, and olive green. All of the colors feature bright chrome hardware, and the black, gray, and olive green colors also offer the option of black hardware. Monowear is all about matching the adapter color to your Watch casing, so you can choose matte silver or polished silver adapters (the bands with black hardware come with matte black adapters). The matte silver adapter isn’t exactly the same color as my aluminum Watch Sport casing, but it’s close enough. Monowear’s Nylon band is probably the sturdiest strap I’ve seen. It’s made of two doubled-up pieces of nylon that are sewn and bonded together, and it features a thick chrome buckle and two chrome loops that are sewn in place. The band is a bit stiff when you first take it out of the box, but it loosens up quickly after you wear it for a few days. I’m a big fan of the bold colors (I tested the red band with matte silver adapters), and this band just looks right with the Watch—even though the material seems like it would be inapposite. 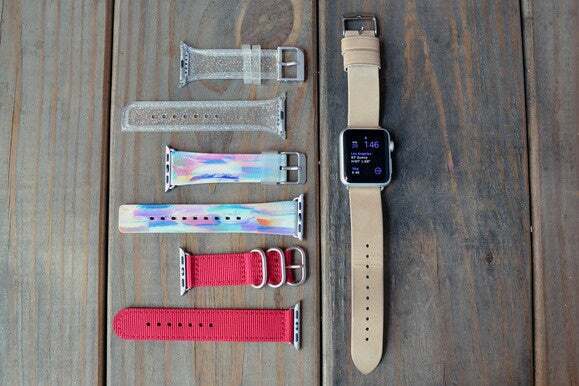 Monowear’s $80 Leather bands are nice, affordable alternatives to Apple’s leather options. 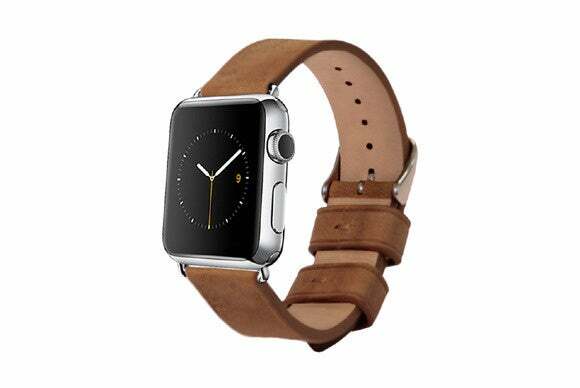 The Monowear Leather band is more of a traditional-looking watch band than the Modern Buckle or the Leather Loop, and, in my opinion, it looks nicer and more expensive than the Classic Buckle. The Leather band comes in five colors and two finishes: The brown, black, and crème colors feature a suede finish, while the poppy red and navy colors have a semi-gloss finish. You can also choose from matte silver, polished silver, or matte dark gray adapters. I tested out the crème suede band with matte silver adapters. The crème color is more prone to getting dirty than I imagine the other colors are, but all in all the band is very sturdy and well-made. The leather is thick but flexible, which makes for a relatively comfortable wear once it loosens up a bit. I personally like Monowear’s Leather band better than any of Apple’s leather offerings, though I do find the Leather Loop to be slightly more comfortable. Don’t get me wrong—the Monowear Leather band isn’t uncomfortable, but you’re not going to forget you’re wearing a Watch anytime soon. Monowear’s Metal band doesn’t really compare to either of Apple’s metal bands—it’s probably closer to the Link Bracelet, but it’s nowhere near as stylish or precisely machined. 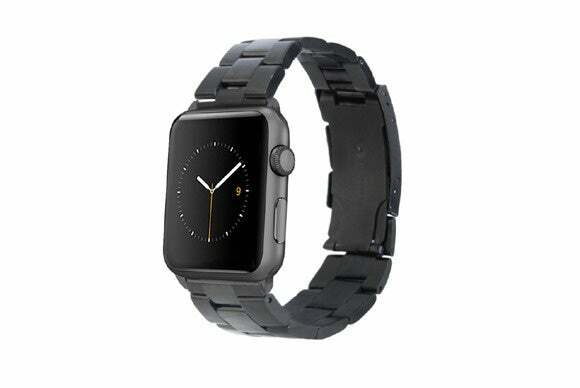 The $100 Metal band, which comes in silver and black, looks just like a traditional metal link bracelet watch band. It’s not unattractive, but similar watch bands are usually priced closer to $50. I tried out the silver Metal band, which has a two-tone finish (polished metal inner links and brushed metal outer links) and a pushbutton deployment clasp. The clasp is easy to work, though it doesn’t lay perfectly flat, and the bracelet is fairly comfortable to wear. The bracelet is approximately seven inches long (closed), and has five removable links to accommodate smaller wrists. Like other Monowear bands, you get to choose your adapter finish from matte silver, polished silver, or matte dark gray. For me, Monowear’s Metal band falls flat. If you have the space gray Watch Sport, the black Metal band might look particularly cool, but otherwise this is just an average metal link bracelet that you can find on just about any drugstore watch. 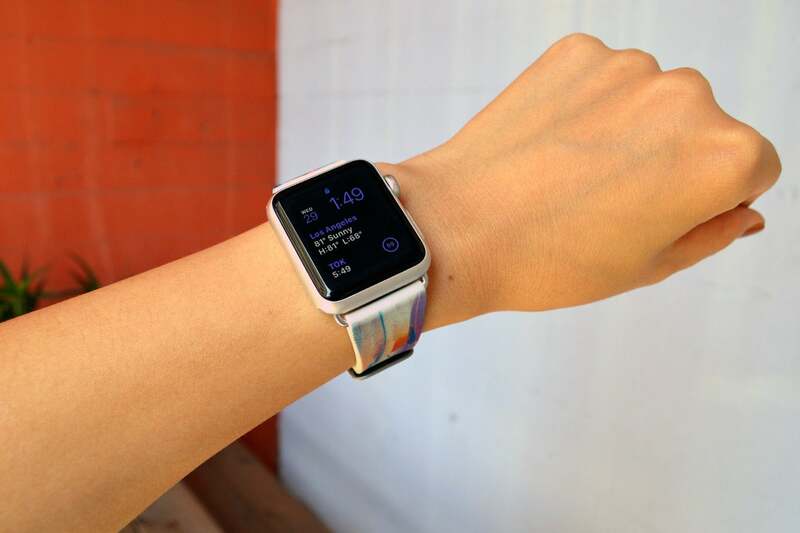 Are you using a third-party Apple Watch band that you love? Sound off in the comments below.